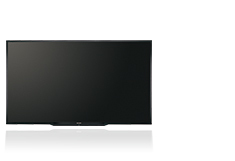 The 90" class (90 1/64" diagonal), 80" class (80" diagonal), 70" class (69 1/2" diagonal) and 60" class (60 3/32" diagonal) Sharp professional LCD monitors combine full-HD image quality and a stylish, thin profile for the ultimate viewing experience. 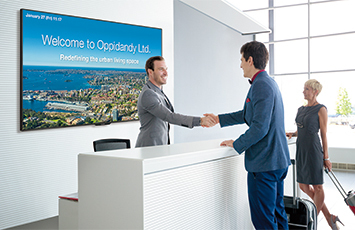 PN-Q901, PN-Q801, PN-Q701 and PN-Q601 professional LCD monitors are perfect for retail settings, waiting rooms and other business locations that need to grab the attention of viewers for a new level of engagement. Business owners can easily manage the functionality of the PN-Q901/Q801/Q701/Q601 professional LCD monitors due their many user friendly features. They include a powerful RS-232C command set, which permits flexible remote control capabilities from connected devices. In addition, displaying still images or videos couldn’t be easier with the USB port. Business owners will also appreciate optimal content control with added lockout features including IR Remote, Power, Volume, Input, OSD disable and LED disable. All this with 16/7 reliability. The PN-Q901/Q801/Q701/Q601 professional LCD monitors have cutting-edge picture technology that delivers amazing detail, gorgeous colour depth and consistent image quality. The advanced pixel structure of the panel enables stunning 4 million : 1 dynamic contrast for deeper blacks and whiter whites. Fit more screen in less space with the PN-Q901/Q801/Q701/Q601 professional LCD monitors. Streamlined for a pleasing appearance and minimal protruding parts, the PN-Q901/Q801/Q701/Q601 weighs only 64/50/34/24 kg. 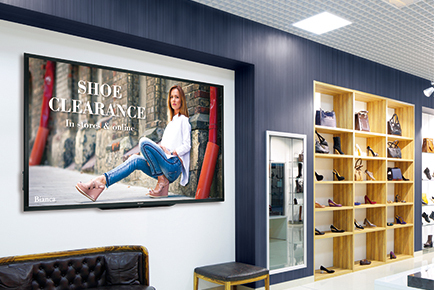 A bezel thickness* of only 26.34/15.53/11.15/11.11 mm makes for easy placement in offices, public places, stores and other commercial establishments. The PN-Q901 professional LCD monitor also has a 44 percent greater viewing area and the PN-Q801 has a 14 percent greater viewing area than a 75" class screen. The PN-Q701 has a 14 percent greater viewing area than a 65" class screen and the PN-Q601 has a 20 percent more viewing area than a 55" class screen. Three (3) HDMI™ inputs let you connect multiple HD sources including digital signage and cable boxes. A powerful RS-232C command set permits flexible remote control capabilities from connected devices. A built-in USB port lets you present a variety of digital content. Simply insert a USB memory device into the monitor and the built-in media player starts playing your photos, music and videos, right away. Compared to conventional CCFL backlighting, LED backlighting on the PN-Q901/Q801/Q701/Q601 helps ensure reliable performance with low power consumption.